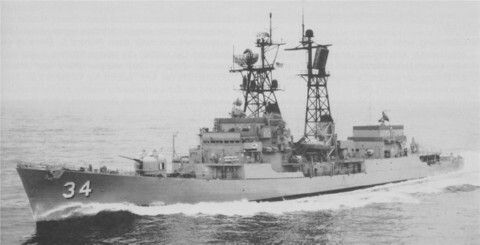 The sixth Somers was laid down on 4 March 1957 by the Bath Iron Works Corp. at Bath Maine Iaunched on 30 May 1958; sponsored by Mrs. Charles E. Wilson; and commissioned on 3 April 1959 Comdr. Edward J. Cummings Jr. in command. On 1 June 1959 the destroyer sailed from Boston Mass. to Newport R.I. before departing the United States five days later for her maiden voyage which took her via Argentia Newfoundland to the ports of northern Europe. On her itinerary were Copenhagen Denmark; Stockholm Sweden; Portsmouth England and Kiel Germany where she represented the Navy during the "Kiel Week" festivities. Somers took leave of Europe at Portsmouth England and after stopping briefly at Bermuda and training for five days out of Guantanamo Bay Cuba transited the Panama Canal on 19 July. She arrived at her home port San Diego Calif. on 27 July and conducted shakedown training along the California coast for the next six weeks. She underwent final acceptance trials on 17 September; then completed just over a month of overhaul from 1 October until 8 November. Over the next six and one-half years Somers alternated between operations out of San Diego and deployments to the 7th Fleet in the Far East. In all she deployed to the western Pacific four times during this period remaining on the west coast in 1962 and 1964. Her first three tours in the Far East were relatively uneventful peacetime assignments consisting of 7th Fleet operations and exercises with units of the navies of the SEATO allies of the United States. During her second and third deployments in 1961 and 1963 Somers steamed to Australia to participate in the celebrations commemorating 19th and 21st anniversaries of the Battle of the Coral Sea. During her fourth tour of duty with the 7th Fleet the destroyer saw her first wartime operations as American involvement in the Vietnam War escalated. She plied the waters of the Tonkin Gulf plane-guarding for Coral Sea (CVA-43) Hancock (CVA-19) and Ranger (CVA-61) as their aircraft pounded enemy supply lines in North Vietnam. On 30 July 1965 Somers got underway from Yokosuka Japan to return to the United States. She arrived in San Diego on 12 August and after a month of leave and upkeep she resumed normal operations along the west coast. She continued to be so engaged until 11 April 1966 when she entered San Francisco Naval Shipyard to begin conversion to a Decatur-class guided missile destroyer. On that day she was decommissioned at Hunters Point. From then until February 1968 Somers was in the shipyard having 90% of her superstructure replaced receiving the Tartar surface-to-air missile system and the ASROC antisubmarine rocket system. In addition her engineering equipment was completely overhauled and she received a lot of additional electronic gear. On 10 February 1968 Somers was recommissioned at Hunters Point as the Navy's newest guided-missile destroyer DDG-34. Her conversion was completed on 16 May 1968 and she departed Hunters Point the next day for her new home port Long Beach Calif. For the rest of 1968 and most of 1969 the guided-missile destroyer ranged the west coast from Mexico to the state of Washington conducting trials and exercises. On 18 November 1969 she got underway to deploy again to the western Pacific. She stopped over in Hawaii from 24 to 28 November and loaded ammunition at the Oahu Naval Ammunition Depot. Continuing westward she paused at Midway on 1 December to refuel and at Guam on the 8th. She made Subic Bay in the Philippines on the 11th. During this deployment Somers returned to the Gulf of Tonkin alternately planeguarding Hancock and serving on the gunline. During late March and early April she joined units of the Australian and New Zealand navies in the SEATO exercise "Sea Rover." After that she returned to planeguard duties this time for Constellation (CVA-64). Two days after joining the carrier however Somers was detached to return to Subic Bay. She arrived on 19 April and remained until the 24th when she got underway for the United States. Somers arrived at Long Beach on 8 May 1970. After an availability period and an extended leave and u~keep period the guided-missile destroyer embarked 35 Naval Reserve Officer Training Corps midshipmen for five weeks training during PACMIDTRARON 70. The cruise commenced on 22 June and was concluded on 6 August at Long Beach. She resumed operations out of her home port until 13 November when she got underway for another deployment to the western Pacific. Somers was assigned to the 7th Fleet from December 1970 until 4 May 1971. During that time she planeguarded the carriers on six occasions rendered naval gunfire support on three and once stood watch on the northern search and rescue station. In between line periods she visited Keelung. Taiwan Hong Kong Singapore and Penang Malaysia in addition to putting in periodically at the naval station at Subic Bay. 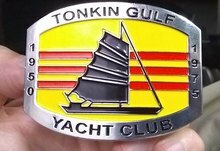 She cleared the Gulf of Tonkin on 4 May headed back to the United States and made Long Beach on the 23d. Somers resumed operations out of Long Beach until 9 July when she began a month of pre-overhaul preparations. On 9 August the guided-missile destroyer entered Long Beach Naval Shipyard to commence regular overhaul. The overhaul lasted until 3 December and following that she went into a period of restricted availability which carried her through 31 December. Somers completed her restricted availability on 3 January 1972 and began trials tests and exercises which lasted through 31 March. After nine days of preparations she headed west on 9 April to rejoin the 7th Fleet. Sailing via Pearl Harbor and Guam Somers made Subic Bay on 29 April. After a voyage to Singapore and back she joined the carriers in the Gulf of Tonkin on 9 May. Her tour of duty in the Far East lasted until late October. She cruised with the aircraft carriers in the Gulf of Tonkin five times during this deployment rendered naval gunfire support three times and stood duty on the south Talos station and PIRAZ station once each. Between line periods she normally put into Subic Bay but managed to visit Sasebo Japan and Hong Kong. Somers returned to Long Beach on 9 November 1972. Two periods of operations from her home port separated by two months of restricted availability at Long Beach took up the first nine months of 1973 for Sorters On 9 October she got underway to deploy to the western Pacific. Stopping at Pearl Harbor from 15 to 21 October she made Subic Bay on 5 November. She remained on duty with the 7th Fleet until midMay 1974 when she reentered Pearl Harbor. As of mid-October 1974 she was still in port at Pearl Harbor.